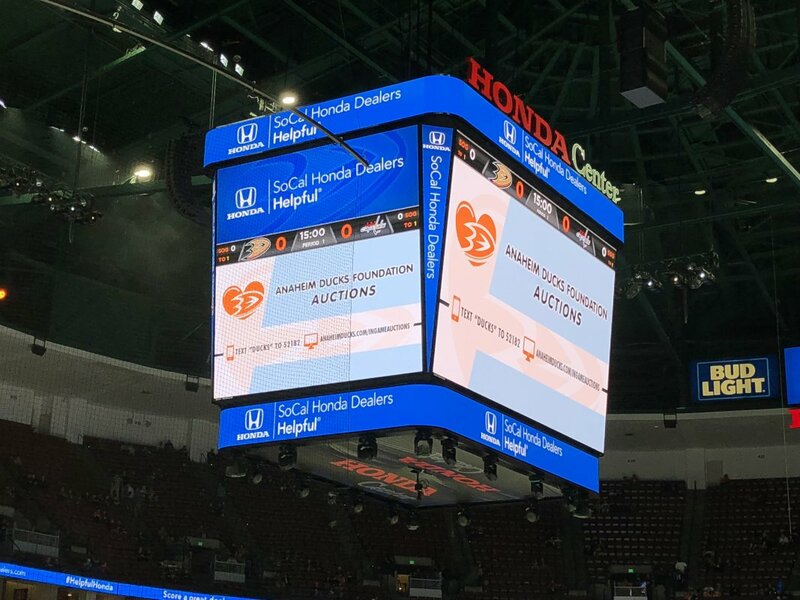 Anaheim’s Honda Center is a quarter-century old now, and from the outside it doesn’t look much different from its early days, when it was known as the Arrowhead Pond of Anaheim. It still has the same pinkish color scheme, the same vast parking lot surrounding it and the same suburban feel befitting its Orange County location. 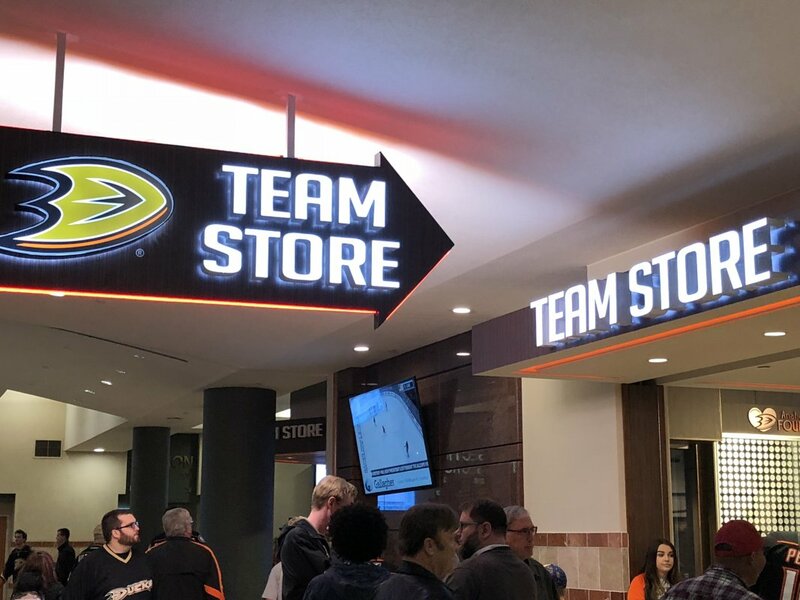 The facility and its primary tenant, the Anaheim Ducks of the NHL, have been hard at work revamping it over recent years, helping it keep up with its fellow arenas in terms of modern amenities and features. 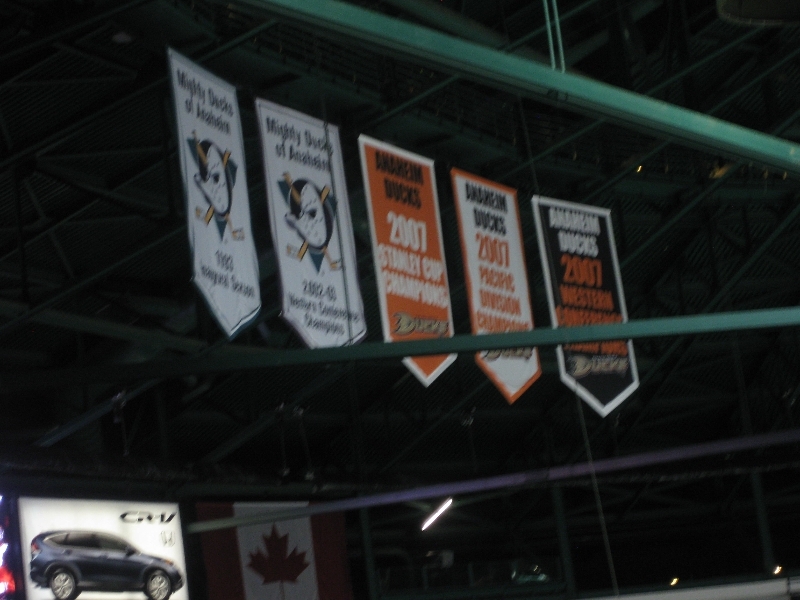 While the Ducks have fielded a competitive squad in recent years — the franchise won the Stanley Cup in 2007 and continue to make deep playoff runs — the facility has also become a spot for college basketball, concerts and other events. 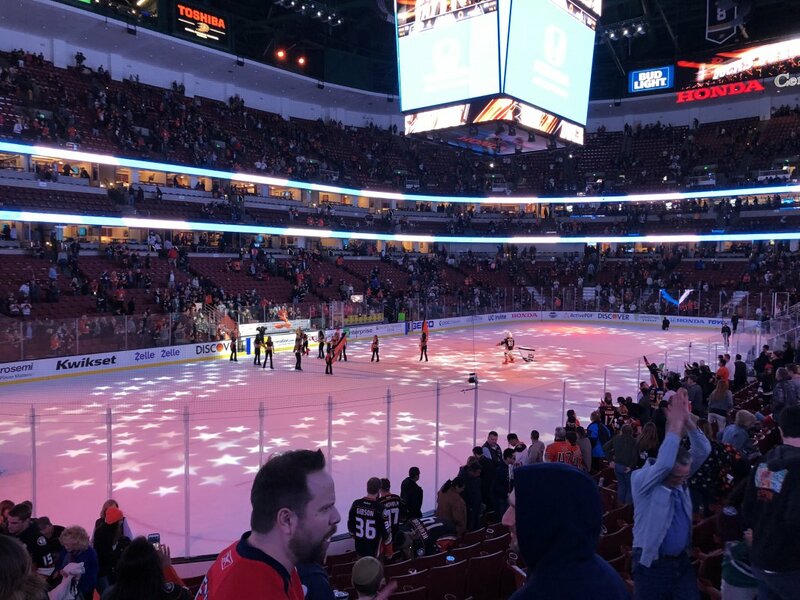 While it still may be suburbia, and while the more attractive tourist draw may still be Disneyland just down the road, the Honda Center has made itself into a venue worth visiting for NHL and other fans alike. For more on visiting the Los Angeles area, check out our Los Angeles/Anaheim city guide. In Orange County, the car remains the most viable option for getting around. Honda Center lies just off Route 57 aka the Orange Freeway, along Katella Avenue, a major east-west street. It’s part of what the city of Anaheim calls the Platinum Triangle, which includes Disneyland as well as nearby Angel Stadium of Anaheim and the Anaheim Convention Center. Also nearby is Interstate 5, which converges with the 57 and another freeway in what locals call the “Orange Crush” (as you can imagine, it’s not a positive nickname). Public transportation is an option, though, and it’s most viable for fans traveling from Los Angeles or San Diego. Amtrak as well as Metrolink, the regional commuter rail service, make stops at the Anaheim station a short walk from Honda Center (if you go this route, check out the new ARTIC transportation center, a snazzy building in its own right). For most events, including Ducks and Angels games, Metrolink runs special event service, meaning there’ll be at least one train running after the game ends. For those who drive, the main parking lot serving Honda Center for general parking is a long, thin strip of land to the north of the arena that can be frustratingly difficult to get into and out of for events. 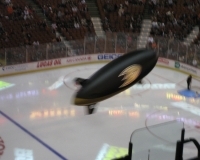 You can find more information on that here; as of the 2017-18 season, general parking for Ducks games and other events cost $20. More savvy fans will park for free to the arena’s east, in one of the many industrial parks nearby or in the fairly large Stadium Promenade shopping center about a half-mile away, on Katella and Main streets (despite large signs saying “NO EVENT PARKING,” our anecdotal evidence has shown us that people do park here and get away with it — more on that in “The Build-Up” below). The closest restaurant/bar to the arena remains J.T. 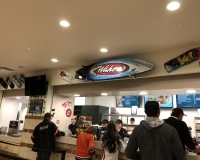 Schmid’s, a mainstay which is directly across Katella, but other chain sports bar types, including Hooters and The Tilted Kilt, are nearby as well. The Tilted Kilt is in the aforementioned Stadium Promenade shopping center, which includes a giant movie theater and several other restaurants, including Lazy Dog and Chili’s. 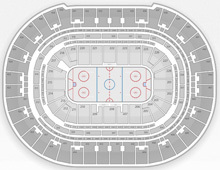 As mentioned, though event parking is highly discouraged, fans do park there, visit one of the shopping center’s establishments and then walk to the game. Another option if you’re visiting the area: Go to Disneyland. In fact, a lot of locals do that well, and it’s not uncommon to see parkgoers in Ducks gear (and the gear of visiting teams, of course) enjoying some time with Mickey Mouse on gamedays. 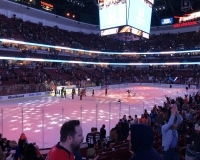 Like many venues, Honda Center has made updates in recent years to modernize the facility and bring it in line with its brethren in terms of fan amenities. The most obvious addition is what’s known as the Grand Terrace, the atrium that faces Katella Avenue — it’s the de facto main entrance to the arena and includes a full-service restaurant and patio area as well as an exclusive outdoor bar and lounge above the entrance. 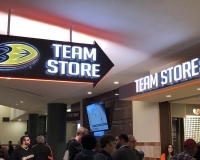 You’ll also find the Ducks Team Store in this area, a much larger retail space than its predecessor. 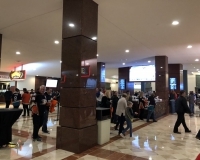 Walking around the concourse, you’ll likely notice the marble floors and walls, which sort of promotes the atmosphere of visiting a fancy hotel. Looking at concessions options, you might also get the sense of indulgence (with the prices to match). 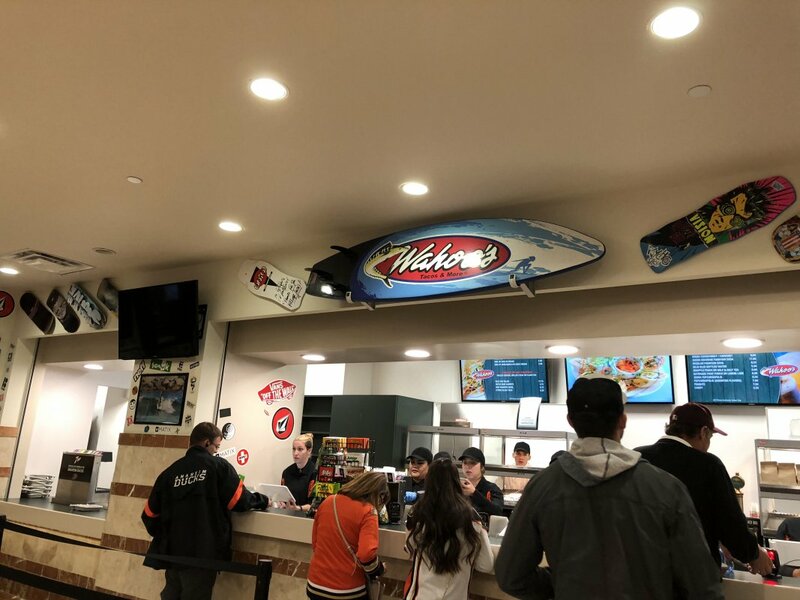 But the food choices have certainly been upgraded over the years, with Orange County favorite Wahoo’s Fish Taco among the stands currently in business. Strangely enough, there are no escalators to be found at Honda Center — elevators are present, but if you’re not a member of the press or staff, or disabled, you’ll be directed to take the stairs, and it’s a not-so-insignificant climb up to the 400 level, or upper seating bowl. 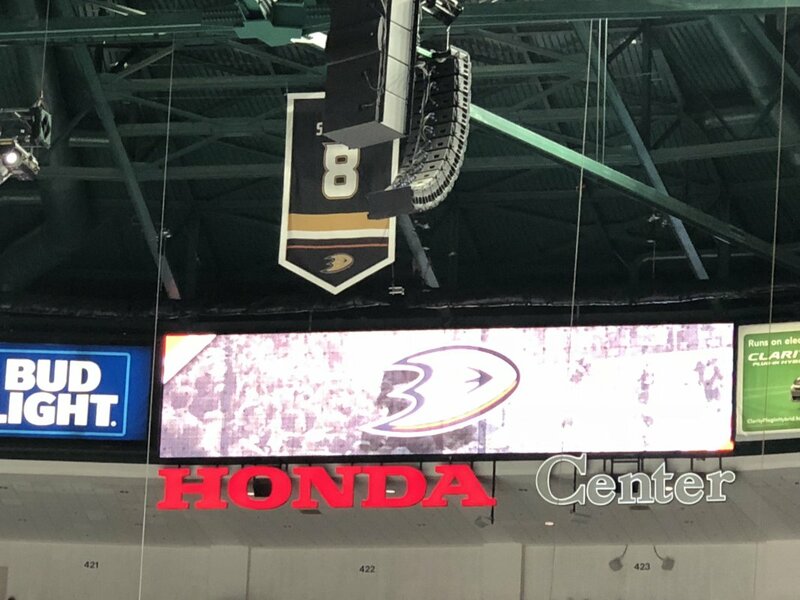 Honda Center installed a new center-hung scoreboard before the 2015-16 season, and it’s a dramatic upgrade over the videoboard it replaced. 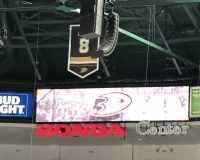 There are also videoboards in the rafters at each end of the ice that, during Ducks games, display secondary game information such as players currently on ice and shift times. The digital screens are nice touches to the viewing experience in a seating bowl that doesn’t feel too cavernous regardless of where your seat location is.